City Lights will have its official digital release on 22 April 2014. A video is to follow. 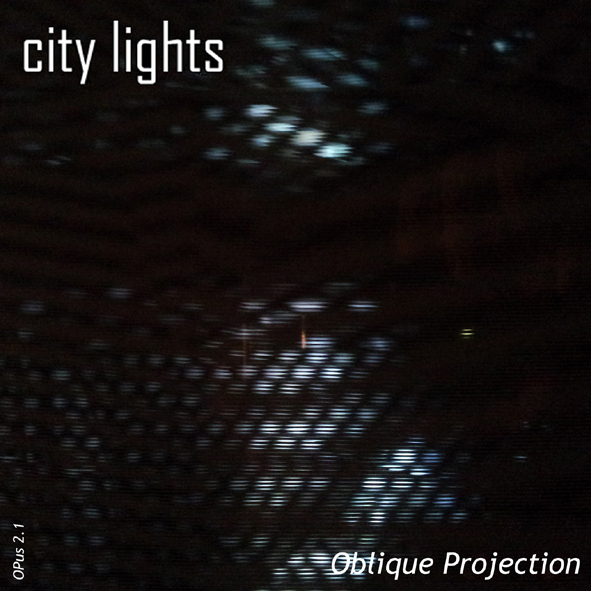 City Lights will be one of the tracks on the forthcoming “Cycles” album. The cycles album is likely to contain the track Storm Clouds over Mestre as well. More news for Oblique Projection in March. 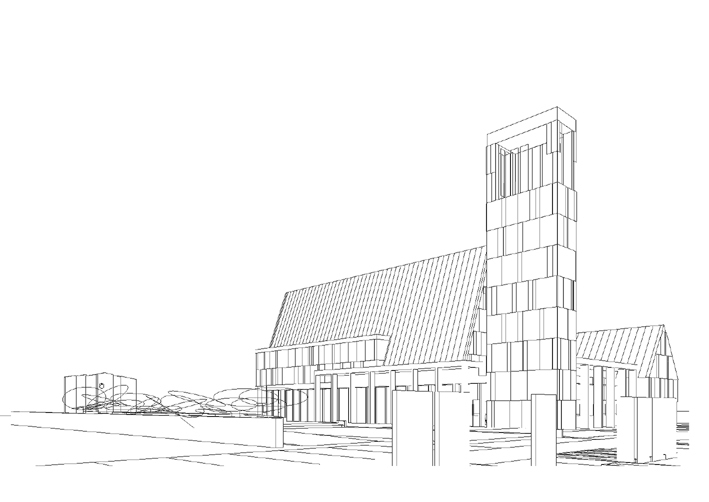 This entry is the report submitted as part of the submission by NJBA A+U to the international competition for a centenary chapel at Glasnevin in Dublin. Death is an end and the beginning of things, to different believers. Located at the end of the cemetery between two railway tracks it cannot be any further along the path of remembrance. It is the last place that the suns rays fall in the day. This work attempts to draw attention, a full stop to that end by anchoring the chapel/temple to that place. The work points itself into the end space embracing a new and mixed landscape to provide space for visitors to halt their movements and reflect on the nature of life, its joys and fears. From left to right (top to bottom) a place has been prepared to remember the paupers randomly interred with a cherry tree lined columbarium and meditation pool. This augments and parallels the 1916 memorial which in turn is augmented by a long plaza that projects into the new landscaped end of the site. 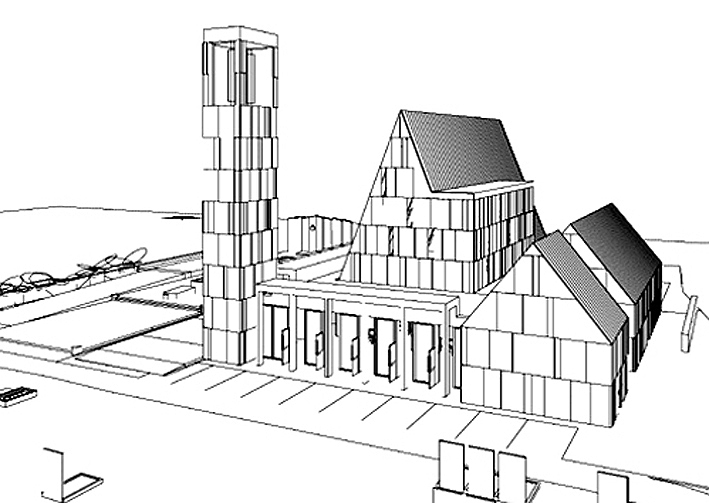 Parallel to this is placed the new chapel/temple with its reflecting pool and garden. Parking is provided in neutral spaces across the front of the site to minimise their impact. This is a place of parallels of equality. At the centre of the organisation is the chapel/temple. This is centred on the catafalque. Chairs are used rather than benches to maximise the individual arrangements for specific creeds. This is wrapped with a columnar space that responds to the new plaza and the large foyer. To the south a service zone for the backup functions is places. A carillon tower anchors the building to the plaza. The elements are made like four “stones” set into the landscape with a pathway binding them together. The intention was to provide a solemn and quiet place allowing light to enter discretely as if invited. The chapel/temple (the centre “stone”) is pierced by slits in the elevation on each side. The room will be experienced differently on each visit. Artificial light will be used to augment this atmosphere using discrete fittings placed in correspondence with the main structure and in the deep walls. The stone and concrete finishes have been chosen to mute the visual spectrum to be solemn and quiet. The heavy stone and concrete elements are used to silence the external world. The structure of the room breaks up the sound to flatten acoustic resonance. 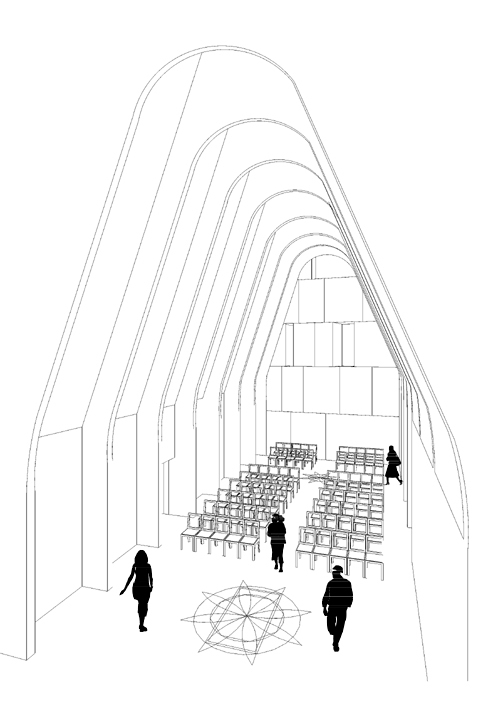 The thick walls and roof system will include acoustic resonance panels to assist the design of the sound space of the chapel/temple. A significant amount of thermal mass has been chosen to provide a stable uniform quality throughout the year. 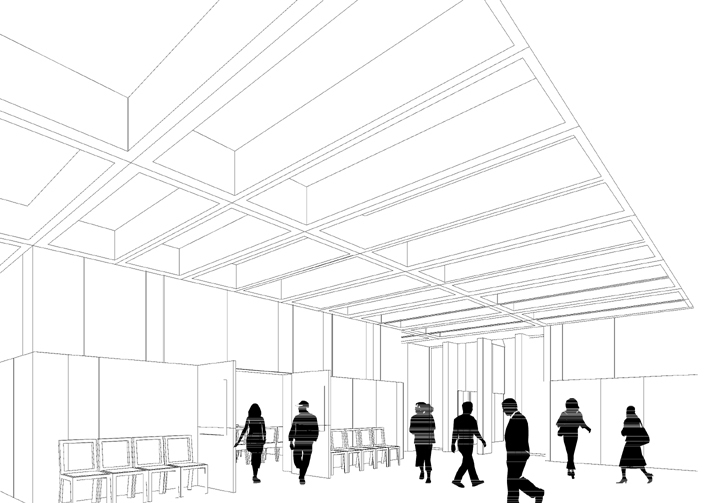 Embedded heat exchangers in the floors and walls will enable the building to be responsive to the changing seasons. The combination of concrete super structure and stone elements provides for equally stable moisture content. The carillon theme has been proposed to anchor the site and the location of the chapel/temple to this place. It is located at the entrance point for the complex to greet the mourner/visitor. Standing tall it marks the beginning also of the new plaza. This represents the first “stone” in the composition. The second “stone” of the composition is the main one, the chapel/temple. 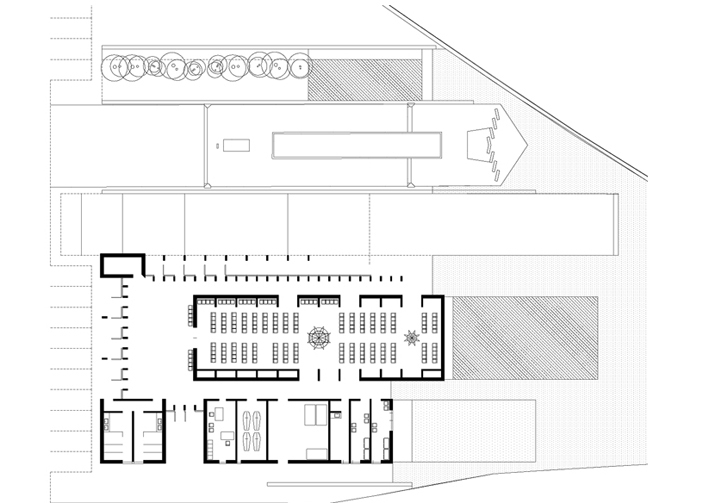 As a multidenominational space it is planned to be flexible to the needs of the congregation. 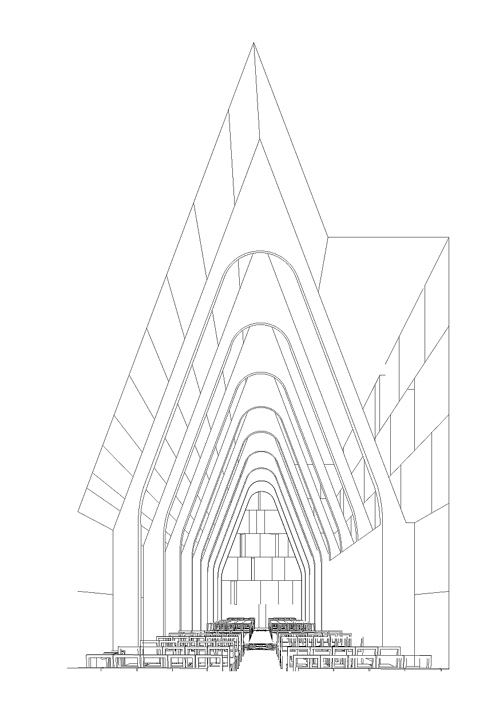 The space is centred in the middle on the location of the catafalque. The chairs rather than benches can be located as shown or according to the demands of specific ceremonies moved out of the way completely. This is subject to the management of the facility though. Directly accessible from the main foyer it has access on two other sides for service personal and serving clerics. The arrangement allows for the exit of mourners to the east end of the facility into the plaza and the contemplative gardens of the work. The arrangement provides for maximum flexibility without sacrificing architectural consistency. The remaining functions are gathered together as a pair of “stones”. The most important of these, the sacristy/robing spaces are placed at the eastern end of the composition with two spaces directly linked by the columnar space surrounding the chapel/temple. Next door to this a private toilet is provided along with a service room for environmental services, a storage room for a minimum of four coffins and the administration office, accessible from the secondary service entrance. To the southern side of the building this external area constitutes the service area for access by the hearse and other service vehicles. The other part of the pair of “stones” is the discrete public toilets providing male, female and universal access toilets for the use of the public. These are accessible both from the main foyer and the outside. As the last of the “stones” it frames the entrances at the front and service entrance to the side. Connecting the four “stones” is a brightly lit columnar ringed space providing generous space for a minimum of 100 mourners with direct access to the chapel/ temple. It is close to the administration office, rear lobby and public toilets. Secondary access to the chapel temple is made available on both sides, providing a route for coffins to the south along with a link to the sacristies/ robing spaces and the universal access toilet for use of celebrants/masters of ceremonies. With a super structure mainly consisting of concrete piled foundations, raft floors, waffle slab roofs (to the main foyer spaces), main chapel/temple trusses the clarity of the structure is a major contributor to the character of the building. To ensure that quality is at the foremost of this decision most of this work is either bespoke or precast under factory conditions. Columns and walls are reconstituted concrete/stone hybrid and the roof is finished in either a tern coated steel or zinc. for the landscape strategy and for the tectonic expression of its large blocks of reconstituted concrete/stone. Light enters in between these large elements conveying their quarried logic. In a field of monuments the work rises up on the same proportional grid as its graves. Anchored and anchoring the 1916 Centenary Chapel is a place of the past, for now and the future.